Aluminium is a chemical element in the boron group with symbol Al and atomic number 13. It is a silvery-white, soft, nonmagnetic, ductile metal. By mass, aluminium makes up about 8% of the Earth’s crust; it is the third most abundant element after oxygen and silicon and the most abundant metal in the crust, though it is less common in the mantle below. Aluminium is remarkable for the metal’s low density and its ability to resist corrosion. Aluminium and its alloys are vital to the aerospace industry and important in transportation and structures, such as building facades and window frames. The intermediate, sodium aluminate, with the simplified formula NaAlO2, is soluble in strongly alkaline water, and the other components of the ore are not. Depending on the quality of the bauxite ore, twice as much waste (“Bauxite tailings”) as alumina is generated. 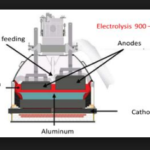 The Hall–Heroult process produces aluminium with a purity of above 99%. PRC, Russia and Canada are the largest producer of aluminium in the world. Australia is the largest producer of bauxite.